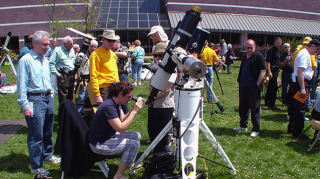 A Northeast Astronomy Forum attendee looks through a telescope. Astronomy enthusiasts — including Space.com — will gather next weekend (April 21-22) to attend the Northeast Astronomy Forum (NEAF), which producers have billed as "the ultimate astronomy and space experience". NEAF began as an outreach project by the Rockland Astronomy Club in 1991, according to producer Ed Siemenn. Today, NEAF hosts workshops, professional and amateur conferences, classes, and children's programs, and it continues to invite bright minds from across the fields of astronomy, aerospace and astrophysics to present at its lecture series. NEAF will be held at Rockland Community College (part of the State University of New York) in Suffern, New York, during the weekend of April 21 and April 22. Suffern, a Rockland County village, is about an hour's drive north of New York City and less than a 4-hour drive from Boston. A presentation at a Northeast Astronomy Forum: The celestial body projected onto the screen is Phoebe, a natural satellite orbiting the planet Saturn. "This year, I'm proud to say we have Nobel laureate and Project Scientist for the James Webb Space Telescope John Mather, as well as Mike Leinbach, former space shuttle launch director; Hans Koenigsmann of SpaceX; and Tom Mulder, Boeing CST-100 Starliner mission designer," Siemenn said. Children play with a toy at the Northeast Astronomy Forum. NEAF 2018 will feature over 100 vendors and booths, with representatives from Lowell Observatory, telescope maker Celestron, the Amateur Astronomers Association of New York and many more, according to the NEAF Facebook page. There will also be free telescope giveaways, model-building at a children's corner and solar-viewing opportunities, according to the event's website. Space.com will have a booth, too — so come find us and say hello! To register, go to http://www.rocklandastronomy.com/neaf.html.